As incoming freshmen, my co-designers and I had all experienced some problems with the school’s room selection process. Mainly, we felt that we weren’t adequately informed before we made our housing decision. This was partially due to the fact that some of the information we wanted was not available, but mostly because the information that was available was not being effectively organized and distributed. 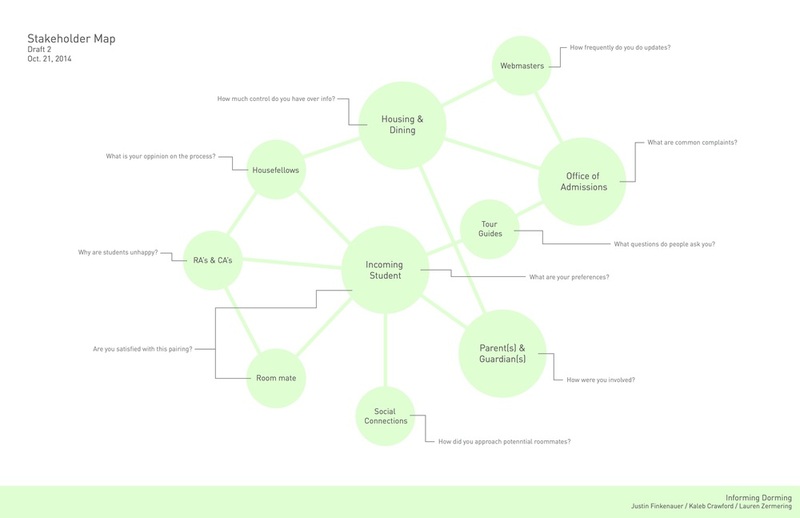 Since our idea was based primarily off our own experience with the school’s housing system, we first needed to assess who our stakeholders were and what our territory map was. That is, we needed to uncover all of the areas and people who were either involved or affected by the room selection system. Once we had narrowed this down, we interviewed Residential Assistants, the Housing Director, the Housing Marketing Director, Housefellows, and freshman students. Through this, we discovered that the dorm selection system is incredibly complex, but that many other students were also unhappy with its provisions. Students felt that a better visual representation of dorms would have been helpful, including dorm photos and a map that put the dorm in context of the city and the school, as well as clearer information about pricing and dorm amenities. We considered the idea of approaching this problem with a physical solution, such as in the form of mail-out information or better on-campus events to help better inform students. Because most of the information was already obtained by students through CMU’s website, however, we thought a redesign of the housing website was most logical. Our proposal included the reorganization of existing information as well as the addition of missing and requested information. The proposed version of the website included a more evident layout, more visuals, clearer descriptions, and the addition of a map and news feed of the dorm’s social events. 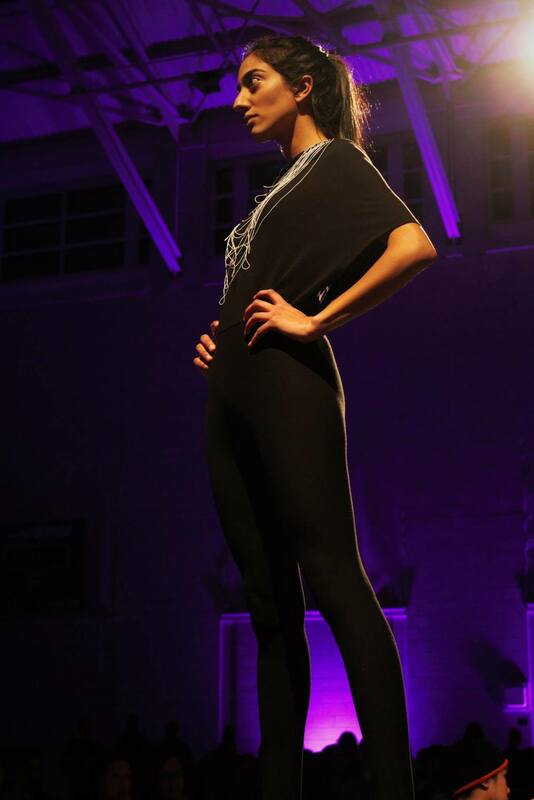 Lunar Gala is an entirely student run-fashion show, occurring every February at Carnegie Mellon University. Students across all majors collaborate to create this show, which brings in about 1000 spectators each year. As part of the 2015 production, I collaborated with a communication design student to design, create, and present a 10-look line named Sinew. Sinew is inspired by the internal structure of the human body, specifically tendons and ligaments. Strong yet flexible, restrictive yet mobilizing, these structures are what hold our muscles and bones together while giving us the ability to move. Our garments, along with a handmade print (based on collagen), meant to restrict and encourage relationships between different parts of the human body. This project began with the development of a unique idea, followed by sketching and brainstorming different looks. We had to compile our concept, a description of our sewing experience, as well as ten of our potential looks to present to the design board in order to be selected for the show. Once selected, we began fabricating by creating patterns for our pieces as well as dying and painting our collagen inspired print. We then sewed together all the looks in rough form and fit the looks to the models for alterations. Lastly, we added the key components, including elastic, nylon string, and thin strips of jersey, which are what ultimately brought much of the interaction and meaning to our line. The result of our work was the inclusion of our line in Lunar Gala: Vestige on February 7th, 2015. Sinew was featured in the show among 21 other student-designed lines. The show was sold out and viewed by 1000 audience members. An excerpt of our line was also featured at the reception of the screening of Dior and I at our school's international film festival.